Is your website in dire need of a makeover? Fear not! 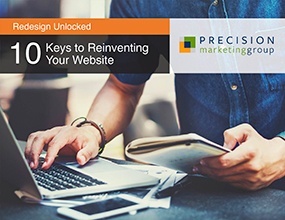 Our free eBook provides a holistic approach to tackling your next digital redesign project. Your website is essentially the face of your business – the first impression your target customers will carry with them. And let’s be honest, a first impression is all it takes to either generate real interest or get left in the dust. In fact, 94% of consumers cite design as a reason they do not trust a company’s website. So now you’re wondering: Where do I even begin? The secrets to a stellar website redesign are at your fingertips. It’s time to turn the key! Fill out the form to get your free eBook now – Simple as that!